Rent vs. buy remains a debate fought by smart people on both sides of the equation! This discussion is about why buying a home makes sense. And it doesn’t mean that renting does NOT make sense. It is all based on the individual!! Source: The Federal Reserve Board’s Survey of Consumer Finances for 2010. 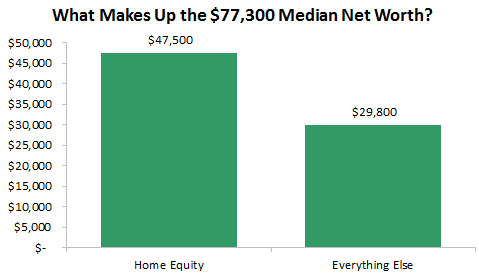 Based on this analysis, housing makes up more than 60% ($47,500/$77,300) of the median family’s cushion. 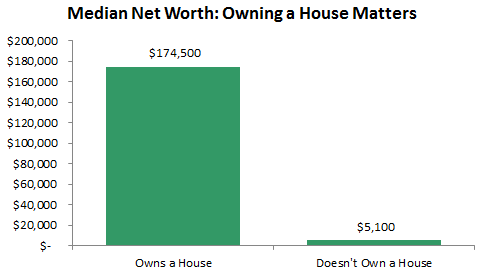 In terms of Median Net Worth, owning a house does matter! That’s over a 30-to-1 net-worth advantage in favor of homeowners. In practical terms this is very simple. Each month, homeowners are automatically squirreling away the principal portion of their mortgage payment — as opposed to the renter, whose whole rent is an expense. If you are able, and it makes sense for your situation, consider the data and make a home purchase! ← RE/MAX TOP REAL ESTATE BRAND IN ORANGE COUNTY! !